Want to stay informed with the latest APCD news? Join our email list to receive APCD updates. The Virginia APCD is a database resource that provides actionable information to employers, insurers, providers, public health practitioners, health policymakers, researchers, and consumers to improve the quality, cost, and accessibility of healthcare in the Commonwealth. The APCD contains paid claims from commercial health insurance companies, the Department of Medical Assistance Services (DMAS), and the Centers for Medicare and Medicaid (CMS) Medicare Fee for Service (FFS). For more information, click here. Most information regarding healthcare delivery is currently limited to individual doctors, hospitals, or health plans, resulting in a narrow view of the healthcare system. The APCD provides both the data and the analytic tools necessary for creating a more accurate, complete picture of healthcare in Virginia. This system-wide view enabled by the APCD facilitates a data-driven, evidence-based understanding of healthcare. Enlightened by expenditure patterns and operational and performance measurements of the healthcare system, all industry stakeholder groups can make better informed decisions that holistically improve the mechanics of healthcare in the Commonwealth. Increased transparency in the cost and utilization of health care can help stabilize the cost of health coverage for employers. Participation in the APCD will allow employers to compare healthcare cost, quality and utilization to a larger population of Virginians than would otherwise be available. Health Insurance companies can compare the performance of provider networks to statewide benchmarks and identify variation in utilization and cost efficiency. Consumers will be empowered with better and more transparent health care pricing information and will benefit from efficiencies that can be achieved by providers and payers. Variation in utilization of health care services maybe used for targeting and evaluating public health programs to improve population health and assessing geographic differences in health care delivery. The APCD will provide the most complete source of measure of treatment of chronic diseases such as diabetes, cardiovascular disease and asthma. Health care providers will gain insights in how the quality and utilization of the care they provide compares with their peers, and can identify and monitor quality improvement projects. The APCD will inform support public policy with information on how the health care system is operating and support data-driven improvements in access, quality and cost of healthcare. How is the APCD administered in Virginia? The Virginia APCD exists under the authority of the Virginia Department of Health (VDH) through legislation passed by the Virginia General Assembly in 2012. VDH contracts with Virginia Health Information (VHI) to administer the APCD to be consistent with the law. The APCD is a voluntary program with participation committed by Virginia’s major health insurance companies. Funding for the database includes 40% from participating health insurance companies, 40% from the Virginia Hospital and Healthcare Association (VHHA), and 20% from VHI. Pricing is dependent on which of these formats is most suitable, as well as the amount of data needed to fulfill the request. 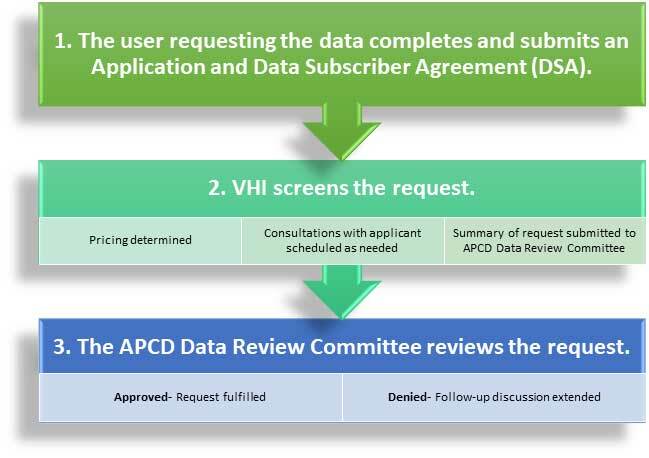 All requests for access to data from the APCD require adherence to an application process, outlined below. All other requests require a more extensive application and DSA that must be submitted. A copy of the full DSA can be provided upon request. Please submit any questions or completed applications here, and VHI will follow up on your request. As the APCD becomes increasingly comprehensive, it provides more insight and ability to all users. Therefore, self-insured employers have an important role to play by having their Third-Party Administrators (TPA) contribute data to the APCD.